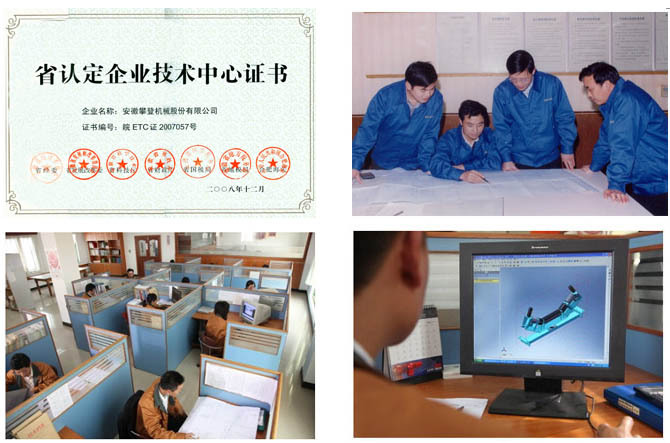 Anhui Pandeng Group always adheres to taking the technological innovation as the fundamental power of enterprise development and makes great effort to cultivate and enhance its core technology. The technical development and research center set up under the group is the “Provincial Enterprise Technology Center” of Anhui Province, which is mainly engaged in the research, development, planning and design of new technology and projects, and has established good cooperative relationship with more than 30 design institutes and relevant domestic famous universities such as Beijing Lifting Transportation Machinery Research Institute, Shanghai Tongji University, etc., and has formed a complete set of technical quality operation and product quality assurance system for R & D, design, manufacture, installation, commission and after-sales service etc. of various types of products.